There's one bench already placed in front of a Frances McCormack painting at the Museum of Contemporary Art in Santa Rosa. On this day, the exhibition's installation is still unfinished, and a utility stool has been hastily left in front of another of her works. Having two places to sit down and contemplate McCormack's oversized canvases proves to be a boon, even were it not so hot and the reporter's notebook so heavy. An instructor at the San Francisco Art Institute, McCormack, whose paintings are part of the "Trinitas" exhibit showing at MOCA through Oct. 10, paints large works mostly abstract in composition and certainly handsome in execution. But a nice long squat on a splattered utility stool provides a deeper look at what "handsome" might mean. The art vs. design struggle--how to free the canvas and the process up, let it be loose while making marks that transcend the merely pretty, working more deeply into the stomach-knotting realm of beauty--is evident in McCormack's works. The eight paintings exhibited at MOCA all share a palette of a rather stylish green/brown complement that both evokes the garden settings McCormack works from as well as the latest color scheme for an upscale hotel room. Rich, juicy colors appear in small patches, as though irresistible. There initially appears to be a pleasing formality to the paintings, one that would reward a quick glance on a dining room wall but needs little more. However, McCormack's canvases ripen past just-plain-pretty in several ways, the most marked being that kinetic clusters of composition make small works unto themselves, offering energy and grace to the rest of the plane. Using a fairly severe structure to each canvas--several of her works feature houselike lines marking out their centers--McCormack gives a crazy freedom to these clusters that offers that thrilling stomach-knot of beauty when really parsed. A long squat also reveals that McCormack's paintings defy gravity, with paint dribbles flowing off the canvas in ways they couldn't possibly do were the piece merely affixed to an easel. Instead, hers are vigorous works that have been turned and considered and painted from different directions, offering disparate escapes from the world created. There is always a way out, even from the civilized wilds of the backyard. And indeed, moving out of McCormack's garden one enters Thekla Hammond's forest. Titled "Impermanence," this installation features some 40 acrylic panels hanging freely from the ceiling upon which Hammond has drawn, scratched and squidged paint to form leaves and birch trunks. 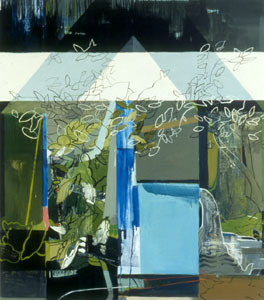 Any suggestion of breeze sends the panels moving, creating shadows on the walls adorned with huge arboreal panels, intended to catch her ephemeral darkenings, as well as on the floor, which, barring the availability of a utility stool, is an excellent vantage point from which to take in the work. Visitors are encouraged to walk through the hanging panels, which is both somewhat frightening--one never wishes to be that cursed soul who trips, flails and wrecks the art--and intensely calming, both at the same time. The final segment of "Trinitas" is the cheerfully nihilistic, little boys' bedroom-like installation of Maria Park. Titled "Paradise Camouflage," Park's site-specific work uses wood-grain contact paper as the image area, with strongly drawn jet fighters adorned by palm fronds upon it, detailed cities and structures seen from above--the easier to bomb them with, my dear--and bright pleasant stripes painted on miniature ovoid droplets of paradise, the whole damned lot about to be exploded. Were the installation better achieved--contact paper is a monster to work with and rebels in art evidently just as it does on kitchen shelving--it would be perhaps a stronger cautionary work, but is so nicely odd that it twinges and pulls anyway. "Trinitas" shows through Oct. 10 at the MOCA, 50 Mark West Springs Road, Santa Rosa. A reception for the artists is slated for Saturday, July 24, from 5pm to 7pm; free. The artists speak on their work on Thursday, Aug. 5, at 5:30. $8-$10. 707.527.0297. Bay Area art star Squeak Carnwath moves to the fiber arts, showing in tapestry medium--should that be a phrase--at the Edith Caldwell Gallery in Sausalito. Carnwath is applauded for the art of her artless drawing and the random words that help to inform the viewer of perhaps nothing at all. She joins such legion as funk daddy William T. Wiley in exploring this different form of presentation, as Wiley has recently also seen his wordy work woven through. Carnwath exhibits with Era and Donald Farnsworth and Alan Magee. Through Sept. 15. 819 Bridgeway, Sausalito. 415.331.5003. . . . Meanwhile, at the Headlands Center for the Arts, German-born sculptor Olav Westphalen labors in the Project Space through July 26. This studio is open to the public from noon to 5pm during the week, and all and sundry are welcome to come watch the artist prepare for his second New York solo show. Westphalen, a participant in the Whitney's 2004 Biennial, uses humor, caricature and comics to criticize and remind us humans of our very humble role in the universe. He speaks on his work on Thursday, July 22, at 8pm. Free. 944 Fort Barry, Eastwing Building 944, Sausalito. 415.331.2787. . . .
Perhaps cursed by Duchamp's freeing dictum that "everything is art," emerging artist Zack Davis aims to push the limit of everything with grid-patterned monkey heads, da Vinci remakes using graph paper and ballpoint pen and other exuberant displays of young, free and so-what. Which is just fine by us. His exhibit "Navel Your Contemplate" shows through Aug. 30. Roshambo, 3000 Westside Road, Healdsburg. Free. 707.431.2051. . . .
Quicksilver Mine Co. in Forestville welcomes back several former Sonoma County artists by hosting exhibits for sculptors Kurt Steeger and Libby Hayes, who left for Grass Valley some years ago, in September; and painter Sam Woolcott and sculptor Poe Dismuke, who left for Arizona shortly thereafter, in November. 707.887.0799. . . .
And finally, painter Paul Wonner's work again deserves mention. While there are those who take small offense at this seminal artist's current designation as "Bay Area Elder Artist of the Year"--as if he had to get old to get good--such petty coats should be thrown off in favor of getting over to the di Rosa Preserve's Gatehouse Gallery to see Wonner's one-man show, exhibiting through Aug. 28 as part of the regular, reservations-only Preserve tour. 5200 Carneros Hwy., Napa. 707.226.5991. From the July 21-27, 2004 issue of the North Bay Bohemian.